Wednesday morning, around 10 AM, ACSO Investigators Josh Pollock, Mark Griever and Tad Huntsman went with parole and probation officer Erik Thomas to Johnny Jarrod Knight’s residence on Ashley 472 to look for a subject that was on parole. While there, the officers found drug paraphernalia. They watch the house, as a search warrant was being written and approved, then came back and found and arrested 4 subjects. Johnny Jarrod Knight, Micheal Preston Carter, Anna Beth Reed, Zachary Norrell and Britney Weckerle’s mugshots are attached. 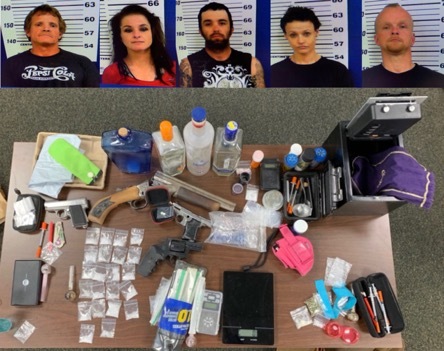 All are expected to be charged with possession with intent to deliver meth, possession with intent to deliver marijuana, simultaneous possession of drugs and firearms, possession of defaced firearms, possession with intent to deliver crack cocaine. Johnny Knight has additional charges of maintaining a drug premises and felon in possession of firearms. Micheal Jarrod knight has additional charges of felon in possession of firearm. They are currently being held in jail, waiting for a bond hearing. This entry was posted on Tuesday, January 15th, 2019 at 12:41 am	and is filed under Police /Legal. You can follow any responses to this entry through the RSS 2.0 feed. You can leave a response, or trackback from your own site. Monticello needs to do more of this. I know a lot of these kinds of people get to jail then O.R. within hours. I think we have more C.I.’s and not that many drug dealers. Good job!!! This will help our community! ?